increased yacht visits will encourage related industry and jobs. 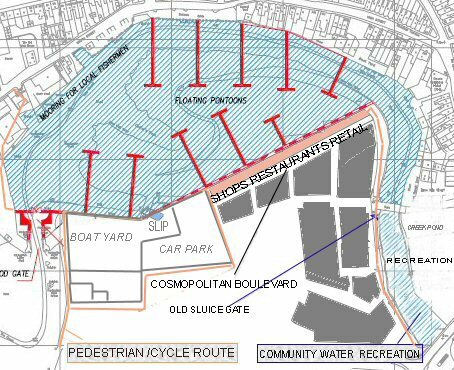 3.1 As a result of, and in response to, the consultation responses received, it is proposed to strengthen the Masterplan Addendum to highlight that the area to the south of the Creek is to be safeguarded for future Creekside leisure, commercial and open space uses. This can be seen in Appendix I. This leaves open the possibility of the Alternative Marina Creek Plan being implemented once the promoters gain funding for their scheme. This entry was posted in Marinas, Planning, Queenborough by admiral. Bookmark the permalink.